In our recent coverage of BbWorld and D2L Fusion, Michael and I came away impressed. Both companies are improving and doing so in ways showing them listening to customers, empathizing, and developing product enhancements with more engaging user experiences. Both companies are doing so by attempting to change their company cultures to support these behaviors. Their challenge, however, is that Instructure is already there - their company culture has supported simplicity, customer-centric empathy, and openness from day one. And what struck me (again) at this year's InstructureCon was how well the company is managed and how consistent is their approach, over time and throughout the organization. Instructure launched its Canvas LMS back in 2010, and it is remarkable how Michael's description from June 2010 could still be applied today. If I had to summarize Instructure’s strategy in one sentence, it would be “They use the lessons learned by consumer web companies to clear the clutter out of LMS software design and business model.” They’re not focusing particularly on open education or analytics or any other hot topics in online education, although they are aware of these and do pay some attention to them. Rather, they are looking at core use cases and trying to make them as simple as possible, throwing out some outdated LMS design assumptions in the process. From the early days when they had dozens of employees to today, when they have over 1,100 employees, the strategy is the same and the company culture is the same. This despite the departure of both founders and the 2015 IPO and all the resultant pressure from investors. This is Instructure's secret. They continue to manage the company to support the strategy of clearing the clutter out of LMS software design and business models. The focus on assessments, quizzes and grade books is both problematic and encouraging. Problematic for the industry as we spend too much time on measurements and grading and accountability and too little time on learning and continuous formative assessment. Yes, the quizzing engine can be used for formative assessment, but in most cases the usage is for summative assessment. But even with this viewpoint, it is encouraging that the primary focus of these product enhancements to Canvas is on reducing the time spent on the grading activities. It is a fact of life that an enormous amount of effort is spent by faculty, particularly in the US, on managing grades. It is good to see tools that directly reduce the pain in this area. In a standing-room only session, Instructure's Christi Wruck explained the initial phase of a multi-year effort to redesign and improve the grade book. Most features shown were of the nature of reducing the number of clicks or simplifying the navigation of grading activities. I won't go into the minutiae here, but this session seemed to generate the most excitement at the conference. 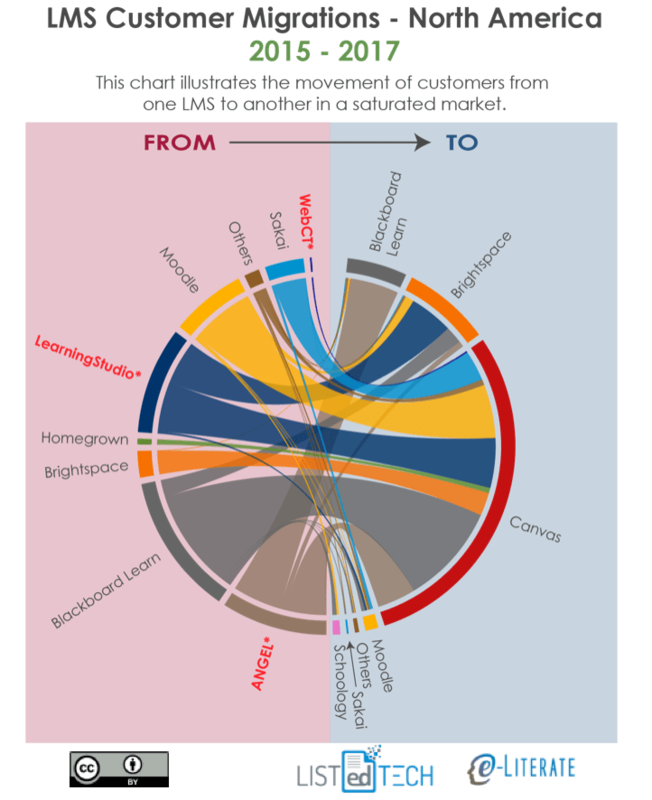 The (re)introduction of analytics surprised me, as I had seen most public efforts in Canvas lately focusing on getting data out to let customers do their own analytics. The initial analytics in Canvas were introduced in 2012, and there were and are a few cool visualizations for faculty mostly, but there is little meat on the bones. There never seemed to be a real product strategy on the developing role of analytics within an LMS nor a full team to work on this challenge. In the meantime they rolled out Canvas Data, which we have talked to staff from several colleges and universities who are actively playing with and exploring the data. But this year Instructure described how they've been hiring a new analytics team and working on new visualizations. As with the previous effort, the initial focus is on helping faculty get a better view of how students are performing. We will have to watch this current focus on analytics to see if a real strategy develops. Blueprint Courses is a overdue features set to allow course design templates or components across courses or shared between instructors. This capability finally provides direct support for centralized course design models involving master courses and multiple course shells as typically used in large online programs. While this capability could be considered late, conference attendees seemed to be quite impressed with the design of the new features. I shared in my post on D2L's Fusion conference how their Brightspace LMS has made impressive wins recently, particularly for schools with large online programs. Canvas continues to gain market share and lead all competitors in new implementations (schools choosing a new LMS), but over the past 12 months they've allowed D2L to at least become a clear competitor. Michael also shared a view from the North American (US and Canada) market for higher education showing that most of Blackboard's "wins" over the past few years have come from ANGEL end-of-life migrations. Looking at that same image, however, it becomes even more obvious just how well Canvas has performed for new implementations. 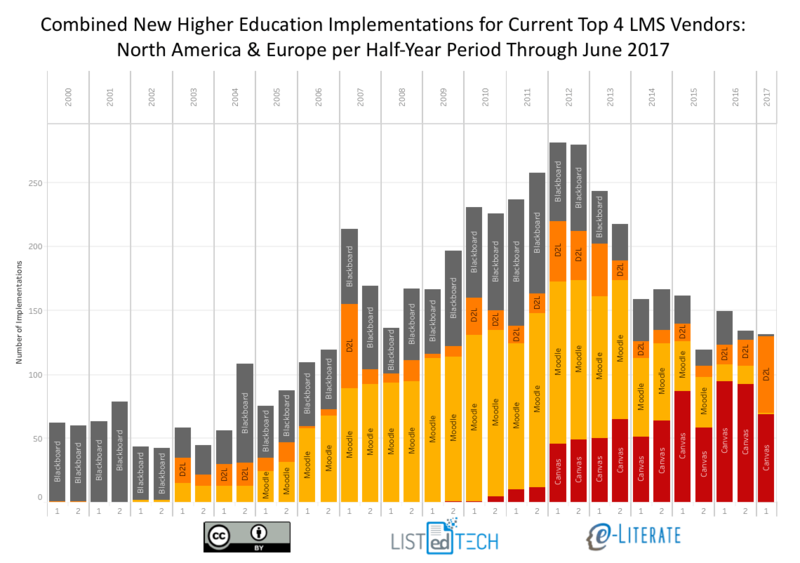 It is not just that Canvas has the lion's share of new implementations, it's also the breadth of migrations coming from Blackboard Learn, Moodle, ANGEL, LearningStudio, Sakai, and even several from D2L Brightspace. Instructure has recorded strong international grown in just the past two years, and this interest was evident at the conference. The most notable difference between the early users conferences and this year's event was the expansion of the customer base. There must be similar numbers of K-12 attendees as there are higher education attendees, and we're now seeing clients from Europe, Latin America, and Australia & New Zealand. Just 2-3 years ago Canvas as an LMS brand was virtually unknown outside of the US and Canada, but now Canvas is winning more than any others in North America, Europe, Latin America, and Oceania. Instructure certainly has challenges to face. In terms of market share, it will be very interesting to look at data for the end of 2017 to see if D2L has maintained its momentum in new implementations. And being a publicly-traded company, investors care not just that Instructure is growing but also whether Instructure is growing fast enough in multiple markets. That's a lot of pressure. On the product front, Canvas was late to the game in terms of supporting mastery learning and associated competency-based education initiatives, although their introduction of MasteryPaths is showing some ability to catch up. Likewise, they certainly are behind their competitors in terms of learning analytics and associated research. And I would even say that they are late in supporting centralized course design models. In all three areas, there are initiatives introduced over the past 12 months to address these product needs. The challenge is for the company to catch up with competitors not necessarily in terms of full feature sets, but more in terms of supporting basic use cases and doing it well. When I asked various Instructure management at the conference whom they saw as their greatest competitor, the most common answer was themselves. The company knows they have work to do, and there is a real sense of "we have to do better" that permeates the company. For Instructure's competitors, the good news is that Canvas has weaknesses. The bad news is that the company knows it. Throughout the conference, I asked a number of attendees what percentage of their motivation for coming was to find out what the company was planning to develop in the next year. The range of answers averaged between 10% and 20%. They all told me that, while they were looking forward to the roadmap sessions later in the week, they didn’t expect any big surprises and weren’t all that focused on finding out what the developers had been doing. I have never been at an LMS conference where that was true, including Sakai conferences and Moodle Moots. Consider the Instructure company profile at Glassdoor. Last year the company was rated #4 best place to work for all small and medium-sized businesses, and Josh Coates was rated #15 for all CEOs in the same category. But also look at the video that Instructure management chose to include in the "Why Work For Us?" section. Other companies tend to put up platitude-filled dreck that tells you very little about their company. But Instructure puts up a 7+ minute video where they talk primarily about company values. In the video, they talk about the behavior the company does and doesn't want - and even nods that they'll get rid of people who have have these behaviors - and they avoid all the pseudo-inspirational messages. While Canvas is a market-changing platform, that is not really Instructure's primary strength. Instructure as a company is the real strength.